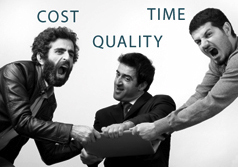 Every project has the elements of quality, time and cost within it. These three fight each other as the project progresses and the project manager needs to keep each in control. 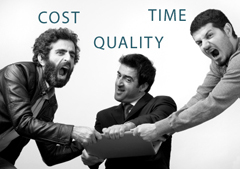 If the project culminates in a fixed event deadline, time can not be compromised, but if deadlines are missed, quality can be compromised as the team rushes to complete the project. Mistakes and inconsistencies are more likely to get through if the job is behind schedule. Costs can escalate too, a simple example of this is that courier costs to an event in Europe can double if you only have two days to deliver instead of four or five. These tensions are inevitable but it may be useful to keep this in mind as the pressure increases towards the end of a project.